Secure water resources, in my line of work, are a basic human right. Therefore hydrofracking, as it is currently regulated and practiced in the United States, is a clear violation of human rights. Water security is a concept defined differently depending on the country, type of water resource, and context. In the case of US hydrofracking, whether the act of fracking or the transportation of fracked material, water security involves human health, environmental health, and community access to safe water. While we have existing legislation to ensure water security in the US Safe Drinking Water Act (SDWA), US National Environmental Protection Act (NEPA), and the US Clean Water Act, these legislations have been rendered impotent by short-sighted modification for industry exceptions and exemptions to act in violation of the very reasons these acts were promulgated. These US federal modifications are prioritizing energy independence over water security and food security as a matter of national security. When it comes to shared water resources, securitizing an issue in this manner removes power and agency from all stakeholders except for the national government, and in a democracy this is a recipe for resource conflict. Water as an inherent human right was affirmed in 2010 under the United Nations Resolution 64/292, and while there is no express right to water security in the United States, the US Safe Drinking Water Act of 1974 ensures national drinking water standards and the US Clean Water Act of 1972 regulates point-source pollution entering our water systems, drinking or otherwise. The US population has been lulled into a false sense of security about their water by the existence of federal policies that are bypassed or are unenforced in favor of industry. Post-9/11, the United States Federal Government prioritized energy security as national security given the geopolitics of oil. This overshadows attention to water and food security. Energy, water, and food are commonly referred to as “the nexus” in DC, but it is erroneous to consider them to be equally important. Water is possible without food or energy, but we cannot produce energy or food without water. 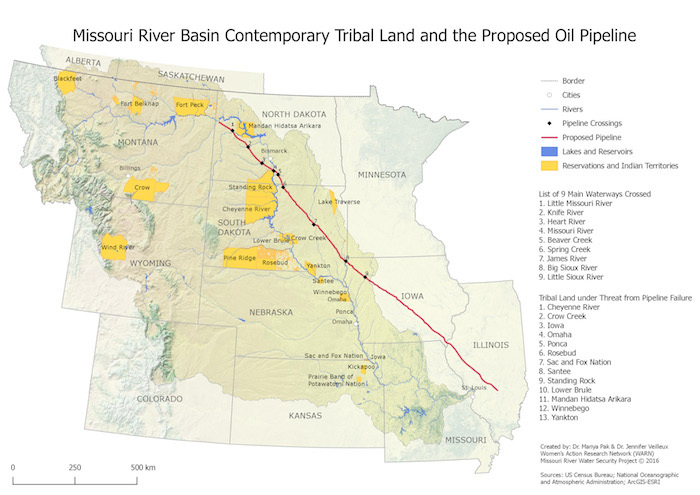 Although President Trump signed for the allowance of continued drilling and commissioning of the DAPL, recent federal court decisions in favor of the Tribes have called the environmental impact of the pipeline into question. The conflict is not resolved. I am grateful for and would like to acknowledge the tireless work of indigenous tribal leadership, particularly Chief Arvol Looking Horse, Paula Horne, Faith Spotted Eagle, Casey Camp, Judith LeBlanc, and Sharon Day for addressing these critical matters to safeguard their own homelands as well as access to safe and secure waters and lands for the rest of mother nature and the people of the United States. I would also like to acknowledge the team of professionals who worked on the Missouri River Water Security analysis. 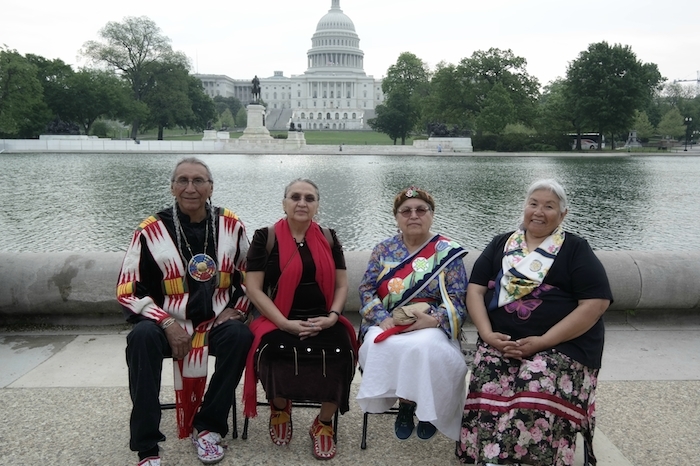 Photo: Indigenous Elder leadership in Washington, DC during People's Climate Change March 2017. Photo by Jennifer Veilleux. Map: Approximate route of the Dakota Access Pipeline—a 1174-mile pipeline built to transport fracked oil from the Bakken region of North Dakota to processing at one of several refineries in the Midwest or the Gulf of Mexico. Map from the Women's Action Research Network (WARN), courtesy of the Jennifer Veilleux. Jennifer Veilleux is a geographer focused on the water security of international rivers. In addition to scholarship, Veilleux uses maps, infographics, photography, and satellite imagery through social media to highlight spatial relationships of environmental justice and human rights issues as relates to water. 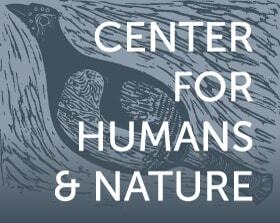 Time to Choose: Violate the Earth, or Create a Respectful Energy Future?